While purchasing new games has shifted from a strictly in-person experience to a largely digital one, Blizzard always makes sure to release physical collector’s editions that reward those who still prefer the in-person method. Yesterday, the contents of the physical collector’s edition for the final installment of StarCraft 2 were revealed and the case is no different. An exclusive behind-the-scenes DVD and blu-ray two-disc set. The Collector’s Edition soundtrack with 21 tracks from Legacy of the Void. The StarCraft Field Manual, which includes illustrations, lore, and much more about the creatures of the StarCraft universe. And of course, the physical DVD-ROM for Legacy of the Void. For those of you who want to play Legacy of the Void immediately when it goes live, the key included in the physical Legacy of the Void Collector’s Edition will grant access to all the in-game content as the digital deluxe version of the game. This would allow you to purchase a digital version of the game ahead of time, while still having an extra digital deluxe key to give away once you’ve received the physical Collector’s Edition box. The standard edition, digital deluxe edition, and physical Collector’s Edition versions are priced $39.99, $59.99, and $79.99 USD, respectively. 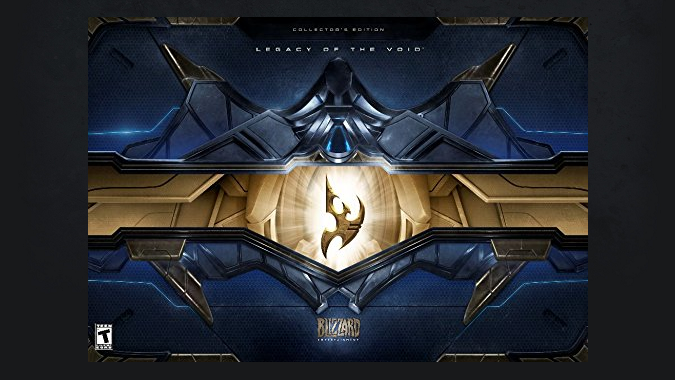 Both digital versions are currently available for pre-purchase from the Blizzard Shop, and the Legacy of the Void Collector’s Edition can be pre-ordered through Amazon. Legacy of the Void launches on November 10th, and pre-orders for any version will grant access to the beta and prologue missions.